5 Settembre 2017 – W.A.P. Phoenix Airfield (ICAO: NZFX) 77°57’23″South, 166°46’00″East did start to be operational last February 2017. This compacted snow runway (WAP USA-NEW) has replaced Pegasus Field (WAP USA-42). This runway is capable of handling wheeled aircraft, that have included to date: Lockheed C-5 Galaxy, Lockheed C-141 Starlifter, Boeing C-17 Globemaster III, Lockheed C-130 Hercules and Lockheed P-3 Orion. 77° 51’ 14”South, 166° 28’ 08” East. 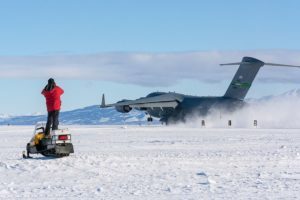 Ice Runway is the principal runway for the US Antarctic Program during the summer Antarctic field season due to its proximity to McMurdo Station (WAP USA-22). In the early 1990’s, the Pegasus Airfield was seen as the facility that would facilitate all-season wheeled aircraft operations at McMurdo. That was the promise…it was developed originally as a “blue ice” runway (meaning that it consisted of long-term ice that was neither accumulating nor ablating). That condition is more actually applied to colder land-based inland locations such as Patriot Hills, rather than a warmer location on shelf ice. Development of Pegasus took place in the early 1990s, near a site which had formerly been used/known as Outer Williams Field. Construction started in 1991-92, the following year an initial 6,000-foot runway was used by wheeled C-130’s, and in January 1994 it was certified for use by C-141 aircraft (early history and links). Initially the runway was only used at the end of the austral summer seasons and was then allowed to accumulate snow cover which would preserve it through much of the following summer season until it was reactivated. 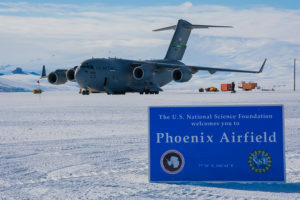 Although Pegasus was originally conceived as part of a “blue ice runway” survey, it actually came to be more properly known as a “white ice runway” as the base was not a permanent glacier, but rather a 100-foot-thick permanent sea ice shelf. The surface came to be maintained with a perhaps 5-inch layer of processed and leveled snow. 77°52’02″South, 167°03’24″East is the principal runway for the US Antarctic Program during the summer Antarctic field season due to its proximity to McMurdo Station. It is actually inactive but maintained as a backup for ski-equipped aircraft.. In 2008-09 the program switched from using 3 airfields; the annual Ice runway (Mc Murdo Station) in early season, Williams Field for ski aircraft, and Pegasus in late season.